This is a chronologic listing of Bathing scenes that appeared in anime, manga and other related media in the year 2004. Satella Harvenheit takes a Shower in a Clawfoot Bathtub behind a Shower Curtain and wears a Bathrobe after getting out. "Burn Up Scramble Ending Credits"
Joshua Christopher has a Tube Bath scene during a Dream Sequence during a Flashback. "Tokusou Sentai Dekaranger episode 1"
Koume Kodou takes a Bubble Bath in a Clawfoot Bathtub with her Rubber Ducks. Harumi Chono has a Shower scene. Joshua Christopher has an Angsty clothed Shower scene in a Clawfoot Bathtub. "Tokusou Sentai Dekaranger episode 3"
Satella Harvenheit has a Mandi Bunga and wears a Bathrobe afterwards. Rosette Christopher takes a Bath and finds a bloody scar on her arm. "Tokusou Sentai Dekaranger episode 5"
"Hunter x Hunter: G.I. Final episode 3"
Gold Dust Girl is seen taking a Bath on her card. "Inuyasha: The Secret of the Cursed Mask"
There are a few Skinny Dipping scenes. "Tokusou Sentai Dekaranger episode 7"
One of the cards that Marika Reimon was guessing with her psychic powers was a drawing of Koume Kodou in a Bubble Bath with her Rubber Ducks. There is an Onsen scene..
"Hunter x Hunter: G.I. Final episode 5"
There is a Skinny Dipping scene with Hisoka Morow. "This Ugly Yet Beautiful World episode 2"
Jennifer Portman has a Shower with Hikari Hoshino. "Tokusou Sentai Dekaranger episode 9"
Koume Kodou takes a Bubble Bath with her Rubber Ducks. "Shinkon Gattai Godannar Second Season episode 2"
"B Gata H Kei chapter 1"
"Shinkon Gattai Godannar Second Season episode 3"
Anna Aoi and Sakura take a Bath together in a Clawfoot Bathtub. "This Ugly Yet Beautiful World episode 4"
Kimi Ninomiya gives Akari a Sponge Bath. "Kochira Katsushika-ku Kameari Kōen-mae Hashutsujo episode 349"
Reiko Katherine Akimoto takes a Bath in a Clawfoot Slipper Bathtub outside as part of a scene in a movie that is being filmed. Ichigo Kurosaki bathes in a Hot Spring with Yoruichi Shihouin. "Shinkon Gattai Godannar Second Season episode 4"
Nanae Hayashi and Hiiragi Touko have a Shower Room scene. "Shinkon Gattai Godannar Second Season episode 5"
Shizuru Fujimura has a Furo scene. "Tokusou Sentai Dekaranger episode 12"
At the beginning of the episode, Koume Kodou is taking a Bubble Bath in a Clawfoot Bathtub, wearing a Shampoo Hat while Shampooing her hair and Singing. The alarm starts for a mission and causes her to run out late still wearing the shampoo hat with shampoo still in her hair. "This Ugly Yet Beautiful World episode 6"
Akari goes Skinny Dipping and later there is an Onsen scene. "Shinkon Gattai Godannar Second Season episode 6"
Luna has a Skinny Dipping scene and later on there is a Shower Room scene with Nanae Hayashi, Hiiragi Touko and Mira Ackerman. Blair is shown having a Bubble Bath at Maka & Soul's apartment in a brief cutaway gag right after a moment where Maka who is getting ready for a fight says that she wants to finish this up and go take a bath. During the Cutaway Blair is shown sitting on the rim of Maka & Souls Bathtub Singing and requesting the magic Scrub Brush to scrub her feet. In the last panel, Blair is shown in the bathtub learning over the edge saying that she is bored and wishes she could go to school like Maka and Soul. "Shinkon Gattai Godannar Second Season episode 7"
Shukuyu has a Shower scene. "This Ugly Yet Beautiful World episode 9"
Jennifer Portman has a Bubble Bath scene. Honey Kisaragi (played by Eriko Sato) is shown taking a Bubble Bath in a Clawfoot Bathtub. "This Ugly Yet Beautiful World episode 10"
Jennifer Portman has a bath scene. Jin has a bath in a Hot Spring. "Tokusou Sentai Dekaranger episode 17"
"Tokusou Sentai Dekaranger 2nd Ending Credits"
Koume Kodou takes a Bubble Bath in a Clawfoot Bathtub. "Daphne in the Brilliant Blue episode 21"
There is a Hot Spring scene with Swimsuits. There is an Onsen scene that involves Densuke and Chiharu bathing and getting along together. "Shinkon Gattai Godannar Second Season episode 13"
There are Tube Bath scenes with Mira Ackerman and Goh Saruwatari. "Tokusou Sentai Dekaranger episode 19"
There is a Bath scene with Miharu Sena Kanaka. Fuu has a bath scene. "Ninin ga Shinobuden episode 3"
Onsokumaru dreams of Kaede Shiranui and Shinobu taking a Bubble Bath and they both end up taking a bath together. "Re: Cutie Honey episode 1"
"Tokusou Sentai Dekaranger episode 24"
"Ninin ga Shinobuden episode 6"
The Intermission of episode 6 of 2x2=Shinobuden was a picture of Shinobu washing herself and Kaede Shiranui in a bathtub. Fuu takes a bath in a Hot Spring. Kirara Mikumari and Yukino have a Furo scene. There is a Bath scene with Tanasuto-Ause-Mu-ruki-Miu Shi-Anosutarurennagureguyugu. Naruto Uzumaki, Jiraiya and other Unnamed Bathers have an Onsen scene. "Mahou Sensei Negima! Introduction Films episode 1"
A picture of Negi Springfield and Kaede Nagase bathing in a Barrel as well as a picture of Ku Fei Skinny Dipping. Later Ayaka Yukihiro is shown Showering. "Mobile Suit Gundam Seed: Special Edition episode 1"
Cagalli Yula Athha has a Shower scene. "Re: Cutie Honey episode 2"
Honey Kisaragi has a Shower scene. "Gantz 2nd Stage episode 2"
"Ninin ga Shinobuden episode 9"
Kaede Shiranui, Shinobu and Miyabi bathe in a Hot Spring in episode 9 of Ninja Nonsense. During a Flashback Bathing Scene, Margaret Burton is seen having her hair Shampooed by her Servant while in a Bubble Bath. "Nurse Witch Komugi Magikarte Z ending credits"
"Tokusou Sentai Dekaranger the Movie: Full Blast Action"
Koume Kodou shares a Bubble Bath in a Clawfoot Bathtub with Marigold Utahime. Margaret Burton is shown sleeping in the Bath during a Flashback Bathing Scene. There is an Onsen scene with Sakura Haruno, Naruto Uzumaki, Sasuke Uchiya and Kakashi Hatake. In a flashback, Lucy takes a Shower in the house of a family she killed. Samantha takes a Shower in the beginning. "Re: Cutie Honey episode 3"
Honey Kisaragi takes a Shower in a Clawfoot Bathtub. "Soukyuu no Fafner episode 12"
Mayu and Nana take a Bath together. "Ai Yori Aoshi: Ryojou Hen"
There is a Barrel Bathtub scene on the cover. 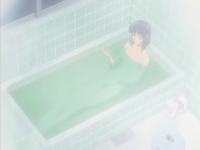 "Tsukuyomi: Moon Phase episode 1"
Nori Sakurada takes a Bath. Mai Tokiha and Mikoto Minagi take a Bath together. "Kannazuki no Miko episode 3"
"Tsukuyomi: Moon Phase episode 3"
Tenma Tsukamoto, Mikoto Suou, Eri Sawachika and Akira Takano have a Bubble Bath scene together. Alexis Rhodes, Mindy Hamaguchi and Jasmine Makita take a bath together in their dormitory's Public Bath. As they bathe, they talk about the boys, particularly Jaden, of whom Alexis takes no interest. Kei Kishimoto has a Shower scene which is followed by a bath scene in episode 6 of Gantz. Koto is shown taking a medicine bath in a day dream in episode 3 of Grenadier. "Mahou Shoujo Lyrical Nanoha episode 5"
There is an Uchiyu scene with Miyuki Takamachi and Nanoha Takamachi. Maho Minami takes a Shower and later on Maho and Yukio Tanaka go Skinny Dipping in a Swimming Pool. Rushuna Tendo has a bath scene in episode 4 of Grenadier. Mariko Skinny Dips in a lake in a dream sequence in episode 6 of Desert Punk. The Skinny Dipping scene from last episode with Maho Minami and Yukio Tanaka continues. Rushuna Tendo has a bath scene in episode 5 of Grenadier. Goro Hona freekicks in the Bathtub after Momoko Hoshino leaves his home. "Tokusou Sentai Dekaranger episode 39"
Koume Kodou has nightmares that start with her waking up in a Bubble Bath in a Clawfoot Bathtub. "Hi Hi Puffy AmiYumi episode 1"
There is a Mud Bath scene with Ami Onuki and Yumi Yoshimura. "Mahou Shoujo Tai Arusu episode 29"
Arusu and Eva take a Bath together. 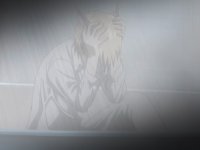 "Soukyuu no Fafner episode 21"
Tae Anegasaki has a Shower. Rushuna Tendo and Mikan bathe in a Hot Spring in episode 8 of Grenadier. Mikoto Suou takes a bath. "Kamen no Maid Guy chapter 2"
Naeka Fujiwara takes a Shower. Rushuna Tendo and Mikan bathe in a Ballon Tub in episode 9 of Grenadier. There is a Public Bath scene with Rushuna Tendo, Teppa Aizen and other Unnamed Bathers. Harima Kenji has a Skinny Dipping scene from Bathing Suit Loss. "Mahou Sensei Negima! Introduction Films episode 2"
There is an Onsen scene showing Sakurako Shiina, Misa Kakizaki, Madoka Kugimiya and Kazumi Asakura. This page was last modified on 26 September 2018, at 12:16.